Shadows Before the Sun is the fourth book in Kelly Gay’s Charlie Madigan urban fantasy series set in Atlanta, Georgia. For the past few books, Gay has been slowly building up the romantic relationship between Charlie Madigan and her siren partner, Hank, as well as further exploring Charlie’s powers. The addition of both Charbydon and Elysian DNA to her mix has made Charlie into a new kind of being altogether; she’s attracted the attention of a creature that was created to destroy the Creator’s first children. When Charlie uses her powers, the creature will hunt her unless she hunts it first. While Charlie is dealing with the inevitable that she will meet this creature face to face sometime soon, she is on a mission to rescue Hank from the siren city of Fiallan. She poses as the oracle Alessandra’s slave and bodyguard to gain access to the city, where she is told that Hank has been executed. She is unwilling to accept this news until she sees his broken body for herself. Gay puts us in Hank’s perspective in this installment for the first time, which ruins some of the tension because readers are aware that Hank is still alive. Hank has long been a favorite character of mine in this series, so even though I felt that Gay lost an opportunity to really mess with her readers, I appreciated the glimpse into his home land and into his head. With these short scenes into his mind, I gained a much more clear image of what Hank and the siren people are like. I truly enjoyed the journey into Elysia, and especially Fiallan. The mythology that Gay uses will feel familiar to those who are knowledgeable about world mythologies, and I loved that in Charlie’s world, the human world was influenced by off-worlders (those from Elysia/Heaven and Charbydon/Hell), who inspired humans to build the Egyptian pyramids and other great historical cities in their cities’ likeness. 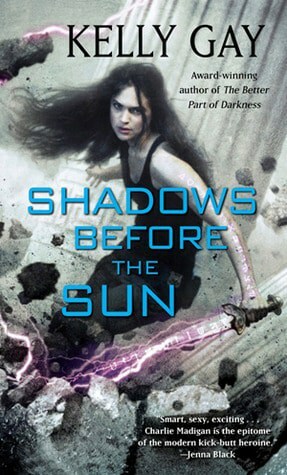 Shadows Before the Sun is also heartbreaking if you are a fan of one of the characters, but I felt that overall this novel ends on a positive note. I suspect that Gay will be ending this series within another book or two; I’ll miss it, but I’m glad that it doesn’t seem as if she will be dragging the series out for as long as she can. If you love urban fantasy but are tired of the same old vampire and werewolf story line, you must read this series. I love to read, and this book sounds so interesting and intriguing! I have not read any of the series of books here. I am going to look up this book, and start at the first edition and work my way threw it! Shadows Before the Sun Sounds Like It Would Be A Great Book To Read.